A rumored play for Yahoo. The struggle to compete with Google in the booming online-advertising market. Microsoft’s claim that Linux and other free software violate more than 200 of its patents. The details of “Surface,” (or Playtable) Microsoft’s long-rumored multi-touch, gestural-recognition interface technology. All these issues are at the top of our minds today as Microsoft CEO Steve Ballmer takes his seat on the D stage. 8:35 a.m.: Moving on now to Windows Vista. 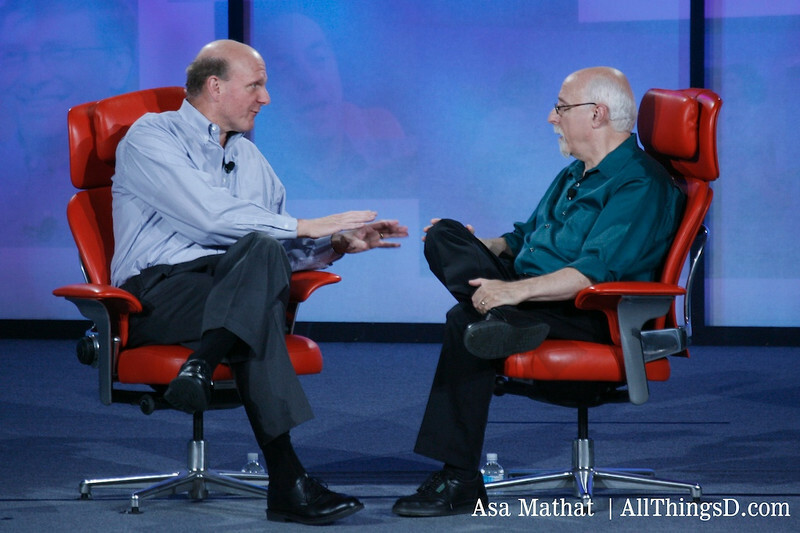 Walt notes that Ballmer has said MS will never take five and a half years to deliver another operating system. “We’ve learned from key mistakes,” Ballmer says, noting that Microsoft has the will and determination to deliver more quickly. Follow-up from Walt: so what kind of schedule are you on? Every two years? Ballmer says different Windows technologies will be released at a variety of different speeds, and that Windows Live services will iterate more frequently. 8:40 a.m.: Walt: The business model that made Microsoft is software–OS, office suite, etc. You seem to be branching out into different business models like advertising and consumer electronics. You used to be about software alone. What’s changed? Ballmer answers that for years, Microsoft thought it should stick to doing desktop software. Today, the company is staking out new positions that are key to its long-term growth. There are technologies today that are critical to Microsoft’s success in the future. “We are developing new muscles,” he says. 8:45 a.m.: Walt: You do seem to have a monopoly on brown consumer electronics. 8:47 a.m.: Ballmer begins demoing Surface for Walt. It’s not yet at a price point where it can be widely brought to market. It will be available this fall through Microsoft’s partners. Wow. Finger painting. Massive multitouch. Dozens and dozens of simultaneous inputs at the same time. Multi-user–no top, no bottom, so many users can sit around it, all at the same time. Recognizes everyday objects with a five-camera vision system. 8:50 a.m.: Walt: How long does this thing take to boot up? Ballmer: (chuckles) It’s always on. Very slick interface. Walt moving photos and videos around the surface of the table with his hands. Walt notes Surface’s user-interface similarities to Apple’s iPhone and some new HP devices, and wonders about intellectual-property issues. “We’re confident in our IP,” says Pete Thompson, general manager of Microsoft Surface Computing. And, he adds, multitouch has been around for a long time. 8:55 a.m.: Real-world applications? Walt asks. Casinos and hotels is the answer. Includes an e-commerce mechanism. Walt asks if the user-interface will appear in other form factors. Microsoft plans thin-panel versions, vertical displays, etc. 9 a.m.: Another real-world application: retail. Example: a T-Mobile store. Two cellphones placed on Surface’s display. Whoa. The device automatically recognizes them, pops up options, pricing and available services. Touch-based jukebox application looks neat as well, but as Walt notes, seems more of a novelty than anything else. Ballmer explains that because the device is Vista-based, it can be continually updated to perform new tasks. 9:05 a.m.: Check it: Video jigsaw puzzle. Walt asks why Microsoft would even build something like Surface. Why didn’t it just design the software and then hand it off to a device manufacturer? Ballmer says it would have been too big a risk to its partners–better to develop it in house. 9:10 a.m.: On to Google–or rather, “the market leader” as Ballmer insists on calling it (he hasn’t actually said the word “Google” yet). Ballmer says the relevance of Microsoft’s search results is going up. He notes that the user interface of Microsoft’s search is stagnant and that there’s a lot of opportunity for innovation. “We’re in the game now.”Walt notes that, while Microsoft is “in the game,” it’s still losing share. Ballmer reiterates that it is making progress. Walt: “Steve, you can say ‘Google,’ you know.” Ballmer obliges and throws in a “Yahoo” for good measure. Walt: Will Microsoft ever develop a phone? 9:20 a.m.: Ah, caveat. Phones need software, and that’s where Microsoft comes in. Walt wonders why a company like, say Samsung, would partner with Microsoft on phones when Microsoft essentially threw it under the bus with music (Plays For Sure). 9:25 a.m. On to the Q&A. On immigration: “Forty percent of the world’s computer science grads come from India and China, and we need to tap into that pool. We must diversify geographically. On smart devices: “Our basic view of the world is that we’ll have a lot of small smart devices that will tie into the world of Web services. People want rich, personalized devices but they also want a ‘my world moves with me’ model that is inherently centralized. Find more D5 coverage at The Wall Street Journal.